Engraving of a sculptured niche on the exterior of the temple at Barolli by Edward Francis Finden (1791-1857) after Patrick Young Waugh (1788-1829). Plate 6 of James Tod's 'Annals and antiquities of Rajast'han or the Central and Western Rajpoot States of India' published in London in 1832. Badoli, situated south west of Kota in Rajasthan, is the site of three fine examples of 10th century Hindu temple architecture. 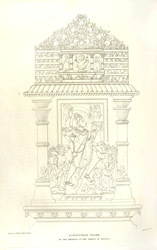 The sculptured niche in this engraving shows the god Shiva as Bhairava. Bhairava, created by Shiva's anger, cut off one of the five heads of Brahma. His punishment for this crime was to wander with the head of Brama attached to the palm of his hand. Bhairava's sins were finally washed away at Benares. In this case, the figure of Bhairava can be identified from the garland of skulls shown hanging around his neck.